As you can see, the entire place is colored in all the shades of red, from ocher rocks to the stone buildings with their roof tiles. Paths of Fairies’ and of Giants’ (real names of the paths, no artistic twist here) lead to discover this magnificent creation of 110 million years (!) old, when the sea, the wind, the rain, the sun and, for sure, some magic joint forces to create one of the world’s most beautiful corners. 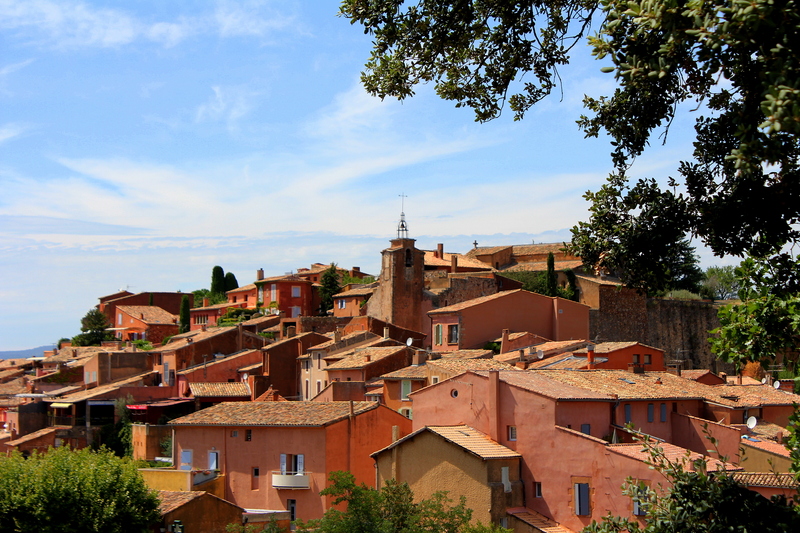 Among all else, Roussillon is a key ocher deposit, and the Ocher Days are celebrated here every May. (Another hot calendar day is Thursday of every week, a Market day). It would be however boring to explain the formation of Roussillon landscape by nature forces only. Of course, there is a legend and, of course, it is all about love (and some drama, we are talking Medieval France here, after all). As the legend would have it (as I eagerly learn from the city’s webpage, back in the days, in the castle up on the hill, Lady Sermond (Dame Sermonde) and Lord Raymond d’Avignon lived. As it happened, the lord was much more interested in hunt than in his lady, so she got bored to death. To cheer up, she got herself a lover, Guillaume de Cabestan (clearly, an honourable knight). Roussillon was not exactly a megalopolis, and soon a word got out about Lady Sermond and the knight. During one of his hunting expeditions (first things first), Lord Raymond brought Sir Guillaume along and casually asked if he, by any chance, was romantically involved with his wife. Not to betray his Lady of the Heart, Sir Raymond swore that he was in love with her sister, Agnès. Apparently, Lord Raymond bought it. So far so good, but this explanation did not serve Lady Sermond. Moved by the sister rivalry and women’s logic of what’s most important, she demanded Sir Guillaume confess everything and not in any other form than a song (as to me, there is a second morale to this legend). The honorable knight obeyed, Lord Raymond finally connected the dots, remembered that he had a wife, and killed the unlucky contender during, naturally, one of his hunting expeditions. And tore his heart away (here comes the drama). Then a sudden twist worthy of The Game of Thrones: as if killing the rival was not enough, Raymond the Sir takes his prey’s heart and makes the castle’s cook serve it as a dinner to Lady Sermond. In the end of the meal he reveals the brilliant recipe. Lady Sermond, seeming suddenly surprised by the consequences of her own making, proclaims that it was the most delicious meal she has ever had and all other future meals would forever fade in comparison. She then throws herself off the castle wall. Her body forever changes the color of the land where she falls to the brightest red, and a spring finds its origin at the spot. I don’t know. To me, all this is to let men hunt in peace. Let me know which village from this trip you want to discover next.